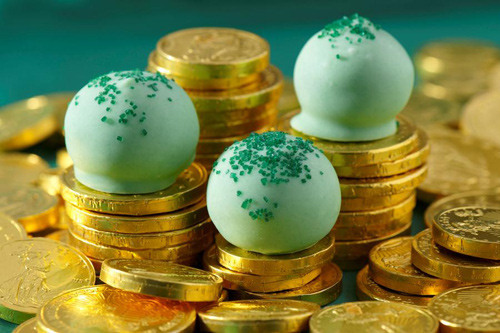 Whether you’re hosting a family get together or having fun with your little leprechaun’s, these cookie balls will make a fun and easy treat for St. Patrick’s Day. This no bake recipe is perfect for children who love to be in the kitchen and can help every step of the way! For even more fun, you could arrange the cookie balls into the shape of a lucky four leaf clover on a large serving platter for guests. Disclosure – As a member of the Kraft Delicious Byte Community, I was provided with this recipe to share. Love love love Oreo Balls. While I think cake pops are darling and good enough, most of the time I make the Oreo Balls instead, look exactly the same and I think they taste so much better. Yummy! They sound delish, and perfect for St. Patrick’s Day! These are so cute! I love the photo! So clever! Woah, yum! I love oreo cookie balls, so I’m sure these are amazing! These look sooooo good. I can’t wait to try them!! Now this is something I can make! Oh those look sooo delicious! I can’t believe how neat your cookie balls are. You are an awesome dipper for sure and the oreo mint…delicious!